By road, the bucolic valley of Swat is just two hours from Pakistan’s capital, Islamabad. But the rules governing everyday life in these two places are centuries apart. In Swat, over the last several years, the Taliban have been waging a barbaric campaign of terror, displacing nearly half the population. Their goal? Forcing the government to establish Sharia law. The government recently capitulated. President Asi Ali Zardari signed into law a decree in mid-April enforcing a medieval Sharia court system in the district of Swat. Taliban judges now control the judiciary in the entire valley and several adjoining areas. 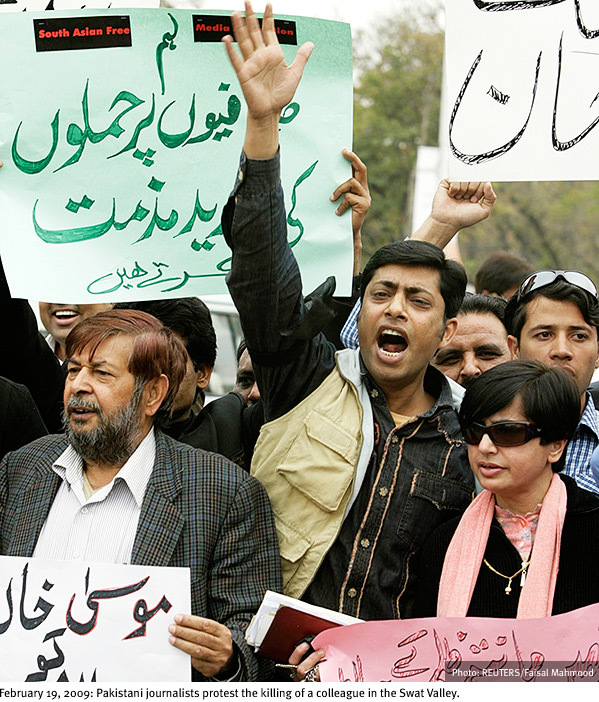 By contrast, Islamabad and the much of the rest of the country have seen two years of sustained mass protests led by lawyers to restore the Supreme Court’s independent judges, who were sacked by former President Pervez Musharraf for refusing to toe his line. This broad-based movement in support of an independent judiciary forced President Zadari to reappoint a chief justice in late March. Pakistan now confronts a bewildering judicial divide: While a Taliban court flogs a girl for having an affair, the Supreme Court chief justice asks the government to explain such barbaric punishments. In this battle of the courts there is a palpable opportunity for the administration of U.S. President Barack Obama to take a new approach toward Pakistan and depart from the disastrous path cut by President George W. Bush and his predecessors, who chose to prop up military rule and reactionary forces in the region. But unless President Obama listens to the people of Pakistan and recognizes the currents of change in this traumatized country, the administration’s strategy of linking Pakistan and Afghan policy—the so-called Af-Pak plan—could spark a spiraling conflict with devastating, far-reaching repercussions. PRESIDENT OBAMA appears committed to transforming his country’s approach to the region. In his March 27 speech on Af-Pak, Obama said that “to defeat an enemy that heeds no borders or laws of war, we must recognize the fundamental connection between the future of Afghanistan and Pakistan.”2 He pledged to increase aid to Pakistan’s army—on condition that the country demonstrates a commitment to “rooting out Al Qaeda and the violent extremists within its borders.” Obama also intends to triple nonmilitary aid to Pakistan, to $7.5 billion over the next five years. Recent political upheavals reveal a groundswell of public support for democratic governance. Given the fact that growing sectors of Pakistani society are politically and culturally opposed to Talibanization, one of the most effective uses of this nonmilitary aid would be to widen the scope of U.S. engagement with the Pakistani people and convince other western countries to do the same. To achieve this, Obama will have to overcome growing concerns in the West that Pakistan is an inherently conservative society that is easily prone to destabilization by extremists. Before Clinton alluded to possible difficulties in securing U.S. aid if he did not cooperate, a belligerent President Zardari had shown he was quite willing to employ the full muscle of state power to crush a popular movement for a free judiciary. In late February, Zardari summarily dismissed the elected government of Punjab, the country’s most populous province. He placed under house arrest Punjab’s Chief Minister, Shahbaz Sahrif, and his brother, Nawaz Sharif, a former Prime Minister. Zardari’s reckless action instantly provoked widespread outrage. Some of his cabinet ministers quit. Several senior police officials resigned rather than use force against massive crowds of protesters. Rather than imposing a crackdown, the army played a mediation role to break the deadlock. Fearing the crisis could derail the already stuttering democratic process, Washington intervened, thereby added critical weight to the swelling popular will. The day after Clinton phoned Zardari, Nawaz Sharif defied house arrest and led a huge march toward Islamabad demanding the reinstatement of dismissed chief justice Chaudhry. The next day, Zardari announced Chaudhry would be returned to his post. One of the lessons to be learned from this successful diplomatic intervention is that U.S. interests in Afghanistan and in the Taliban-dominated tribal areas can and ought to converge with those of Pakistani civil society. An important but long ignored component of the strategy to defeat Al Qaeda and counter its ideology is for the United States to build partnerships with the growing pro-democracy elements. AN INDEPENDENT JUDICIARY, a strong political culture and, above all, a rising level of citizen participation in politics are all consonant with U.S. ideals. Strengthening civil society institutions and promoting democracy are much more effective means of containing the spread of Taliban-style extremism than is continuing to rely on dictators like Musharraf or unpopular leaders like Zardari. The results have been disastrous. The frequency and scale of terrorist attacks in Pakistan have increased. Taliban fighters now control vast portions of the tribal regions in both Pakistan and Afghanistan. Thousands of civilians, soldiers, and militants have been killed. And an estimated 800,000 Pakistanis have fled their homes to avoid getting caught in the crosshairs of the “war on terror,” according to the Human Rights Commission of Pakistan. The mood of the Pakistani people appears increasingly contradictory—intense fear exists side by side with rising hope. Despite a torrent of terrifying threats—a brutal, unrelenting campaign of terror by the Taliban and Al Qaeda, and a continuing barrage of U.S. air strikes—the country is abuzz with optimism due to the growing strength of the pro-democracy campaign. The two years of sustained political agitation resulted in a clear victory for this movement; the lawyers who led the protests over the judicial crisis—and the young professionals, business people, and other citizens who supported them—represent a potent political force that must be reckoned with. This poll cannot be construed, however, as broad support for religious extremists. As the widespread public sympathy for the sacked judges and protesting lawyers illustrates, Sharia law is not the people’s choice. The Taliban forbid the education of women, and prohibit NGOs and any form of music or entertainment media in the areas they control. This Taliban way of life runs counter to the cultural values and practices prevalent in much of the rest of the country. Perhaps most telling, none of Pakistan’s major, mainstream political parties is pro-Taliban. These parties need support to become more democratic and better organized. Educated girls and women, politically active groups like lawyers, traders, and students, and institutions like the resurgent judiciary cannot exist in a Talibanized system. Like the Obama administration, the reinstated chief justice Chaudhry abhors unlawful detention and torture of terror suspects (one of the reasons that Musharraf sacked him). A strong, independent, secular judiciary is essential to prevent the state of Pakistan from disintegrating—and the United States should play a part in helping to strengthen it. THE “SURGE” in U.S. troops in Afghanistan has already elicited a formal reiteration of unity between Pakistani and Afghan Taliban groups. Meanwhile, well armed Taliban groups concentrated in the north-western Pashtun belt are running mini-states under the pretence of enforcing Sharia. Between the U.S. missiles and Taliban bullets there is little left for people to choose. The United States and Pakistan share a great fear of terrorism. But it is the Pakistani people who most directly experience the tyranny of the Taliban. In fact, Al Qaeda-inspired terrorism hits Pakistan’s cities and streets more often and more viciously than any other place in the world. The biggest, most conspicuous failure of U.S. Pakistan policy is that it has failed to exploit these common fears and work towards shared goals. Against this background, President Obama’s stated willingness to identify and engage so-called “moderate Taliban” while the military targets the elusive Al Qaeda is based on a false assumption (or perhaps wishful thinking). Presupposing that unlike Al Qaeda, some of the many Taliban movements may be amenable to co-option by the United States is dangerously false. Pakistan’s attempts to make deals with the Taliban have repeatedly backfired. The Musharraf government, for example, made deals with the Taliban in South Waziristan and North Waziristan, granting them the power to enforce Sharia courts and giving them immunity from past crimes. The deals led to further entrenchment of Taliban power and ultimately fell apart. Similarly, President Zadari’s recent peace pact in Swat has been pushed through in the hope there will be some measure of peace and an end to fighting. The results so far have not been promising. Not only have the militants established their writ and strengthened their positions, they are also refusing to disarm and are actively exporting their rule to adjoining districts of Swat. While Obama may justifiably believe that the Af-Pak military campaign must not be slackened, his strategy will succeed only if the administration recognizes that trying to make deals with the Taliban emboldens them and imperils Pakistan’s already fragile civil institutions. Najum Mushtaq, a writer based in Nairobi, Kenya, is a contributor to PRA’s Right Web (https://rightweb.irc-online.org/) and a former assistant editor of Pakistan’s The News. 3. “Clinton Warned of Aid Cut if No Deal” Dawn, March 17, 2009. Washington Post, March 17, 2009. 7. Carlotta Gall, “Pakistani and Afghan Taliban Unify in Face of U.S. Influx”, The New York Times, March 27, 2009.